Sacred Hearts Academy - The Blog: Academy 6th Grader Dances in Hollywood Movie "Aloha"
Academy 6th Grader Dances in Hollywood Movie "Aloha"
Sacred Hearts Academy 6th grader Kauionalani Emond can add a Hollywood major motion picture to her future resume. Emond was cast as a hula dancer for the movie "Aloha" starring Bradley Cooper, Rachel McAdams and Emma Stone. Filming took place in 2013 and the movie is set to be released in theaters on May 29, 2015. 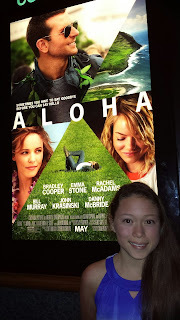 Emond and her family attended the Cast & Crew screening at Ward Theaters earlier this month and got to see Kaui and her hula sisters on the big screen. Watch for her in the very last scene of the movie and look for her name as the credits roll!